`What do you like doing best in the world, Pooh? '`What I like best in the whole world is Me and Piglet going to see You, and You saying, `What about a little something?' and Me saying, 'Well, I shouldn't mind a little something, should you, Piglet. 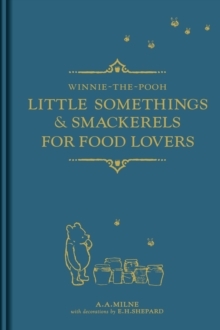 'Winnie-the-Pooh has never been shy about his love of good food especially when his friends offer him a little smackerel of something or other. If you know, or even are, a real food lover, then this is the perfect little gift for you. Filled with A.A.Milne's most delicious quotes and E.H.Shepard's tempting drawings, you'll soon find yourself drooling over a honey pot or two.